Find fun and unique scrapbooking ideas, plus find a huge selection of Cricut cartridges and supplies priced way below retail. Visit our site today and enter our monthly drawing for your chance to win a free Cricut cartridge. 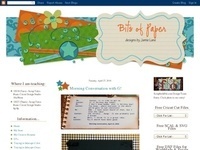 Bits of Paper - Daily Posts! Free SVG, SCAL, and CDS files mixed in with cards and layouts!